Their damage lies in their subtlety and the way they can engender that classic response, ‘It’s not them, it’s me.’ They can have you questioning your ‘over-reactiveness’, your ‘oversensitivity’, your ‘tendency to misinterpret’. If you’re the one who’s continually hurt, or the one who is constantly adjusting your own behaviour to avoid being hurt, then chances are that it’s not you and it’s very much them. Being able to spot their harmful behaviour is the first step to minimising their impact. You might not be able to change what they do, but you can change what you do with it, and any idea that toxic somebody in your life might have that they can get away with it. There are plenty of things toxic people do to manipulate people and situations to their advantage. They’ll keep you guessing about which version of them you’re getting. They’ll be completely lovely one day and the next you’ll be wondering what you’ve done to upset them. There often isn’t anything obvious that will explain the change of attitude – you just know something isn’t right. They might be prickly, sad, cold or cranky and when you ask if there’s something wrong, the answer will likely be ‘nothing’ – but they’ll give you just enough to let you know that there’s something. The ‘just enough’ might be a heaving sigh, a raised eyebrow, a cold shoulder. When this happens, you might find yourself making excuses for them or doing everything you can to make them happy. See why it works for them? Stop trying to please them. Toxic people figured out a long time ago that decent people will go to extraordinary lengths to keep the people they care about happy. If your attempts to please aren’t working or aren’t lasting for very long, maybe it’s time to stop. Walk away and come back when the mood has shifted. You are not responsible for anybody else’s feelings. If you have done something unknowingly to hurt somebody, ask, talk about it and if need be, apologise. At any rate, you shouldn’t have to guess. You don’t owe anybody anything. If it doesn’t feel like a favour, it’s not. They won’t own their feelings. You’ll find yourself justifying and defending and often this will go around in circles – because it’s not about you. Be really clear on what’s yours and what’s theirs. If you feel as though you’re defending yourself too many times against accusations or questions that don’t fit, you might be being projected on to. You don’t have to explain, justify or defend yourself or deal with a misfired accusation. Remember that. They’ll make you prove yourself to them. They’ll regularly put you in a position where you have to choose between them and something else – and you’ll always feel obliged to choose them. Toxic people will wait until you have a commitment, then they’ll unfold the drama. ‘If you really cared about me you’d skip your exercise class and spend time with me.’ The problem with this is that enough will never be enough. Few things are fatal – unless it’s life or death, chances are it can wait. They’ll lie before they ever apologise, so there’s no point arguing. They’ll twist the story, change the way it happened and retell it so convincingly that they’ll believe their own nonsense. People don’t have to apologise to be wrong. And you don’t need an apology to move forward. Just move forward – without them. Don’t surrender your truth but don’t keep the argument going. There’s just no point. Some people want to be right more than they want to be happy and you have better things to do than to provide fodder for the right-fighters. They’ll be there in a crisis but they’ll never ever share your joy. They’ll find reasons your good news isn’t great news. The classics: About a promotion – ‘The money isn’t that great for the amount of work you’ll be doing.’ About a holiday at the beach – ‘Well it’s going to be very hot. Are you sure you want to go?’ About being made Queen of the Universe – ‘Well the Universe isn’t that big you know and I’m pretty sure you won’t get tea breaks.’ Get the idea? Don’t let them dampen you or shrink you down to their size. You don’t need their approval anyway – or anyone else’s for that matter. They’ll leave a conversation unfinished – and then they’ll go offline. They won’t pick up their phone. They won’t answer texts or emails. And in between rounds of their voicemail message, you might find yourself playing the conversation or argument over and over in your head, guessing about the status of the relationship, wondering what you’ve done to upset them, or whether they’re dead, alive or just ignoring you – which can sometimes all feel the same. People who care about you won’t let you go on feeling rubbish without attempting to sort it out. That doesn’t mean you’ll sort it out of course, but at least they’ll try. Take it as a sign of their investment in the relationship if they leave you ‘out there’ for lengthy sessions. They’ll use non-toxic words with a toxic tone. The message might be innocent enough but the tone conveys so much more. Something like, ‘What did you do today?’ can mean different things depending on the way it’s said. It could mean anything from ‘So I bet you did nothing – as usual,’ to ‘I’m sure your day was better than mine. Mine was awful. Just awful. And you didn’t even notice enough to ask.’ When you question the tone, they’ll come back with, ‘All I said was what did you do today,’ which is true, kind of, not really. They’ll bring irrelevant detail into a conversation. When you’re trying to resolve something important to you, toxic people will bring in irrelevant detail from five arguments ago. The problem with this is that before you know it, you’re arguing about something you did six months ago, still defending yourself, rather than dealing with the issue at hand. Somehow, it just always seems to end up about what you’ve done to them. They’ll make it about the way you’re talking, rather than what you’re talking about. You might be trying to resolve an issue or get clarification and before you know it, the conversation/ argument has moved away from the issue that was important to you and on to the manner in which you talked about it – whether there is any issue with your manner or not. You’ll find yourself defending your tone, your gestures, your choice of words or the way you belly moves when you breathe – it doesn’t even need to make sense. Meanwhile, your initial need is well gone on the pile of unfinished conversations that seems to grow bigger by the day. ‘You always …’ ‘You never …’ It’s hard to defend yourself against this form of manipulation. Toxic people have a way of drawing on the one time you didn’t or the one time you did as evidence of your shortcomings. Don’t buy into the argument. You won’t win. And you don’t need to. We all get it wrong sometimes but toxic people will make sure you know it. They’ll judge you and take a swipe at your self-esteem suggesting that you’re less than because you made a mistake. We’re all allowed to get it wrong now and then, but unless we’ve done something that affects them nobody has the right to stand in judgement. Knowing the favourite go-to’s for toxic people will sharpen your radar, making the manipulations easier to spot and easier to name. 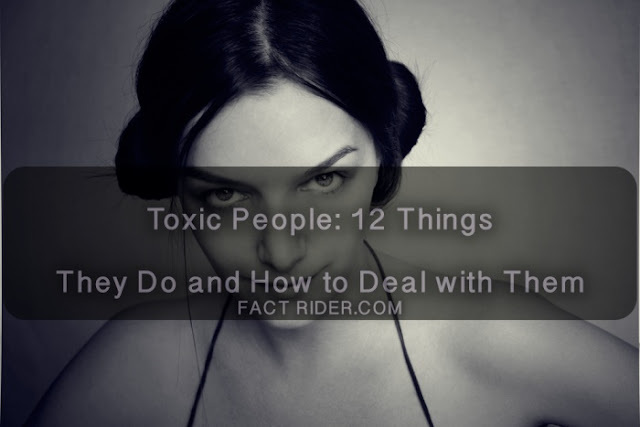 More importantly, if you know the characteristic signs of a toxic person, you’ll have a better chance of catching yourself before you tie yourself in double knots trying to please them. Some people can’t be pleased and some people won’t be good for you – and many times that will have nothing to do with you. You can always say no to unnecessary crazy. Be confident and own your own faults, your quirks and the things that make you shine. You don’t need anyone’s approval but remember if someone is working hard to manipulate, it’s because probably because they need yours. You don’t always have to give it but if you do, don’t let the cost be too high.